The violin making workshops are extremely popular at Halsway Manor; some of the participants have been coming back year after year. 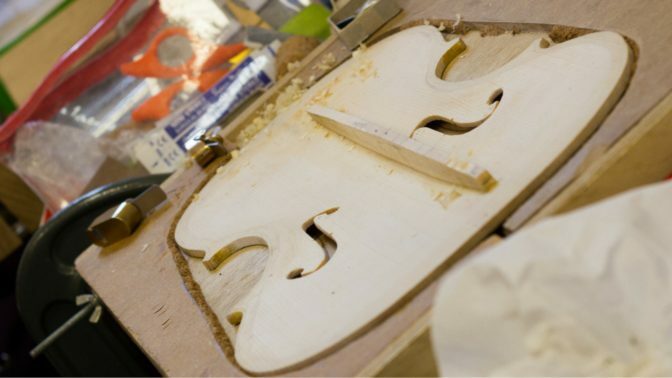 The workshop gives maximum continuous time at the workbench supported by Neville Gardner, who has been teaching violin making for twenty years. He is joined by Corrie Schrijver to ensure that there is a ratio of 1 tutor to no more than 5 participants giving plenty of patient and knowledgeable support. Course begins at 2pm on Monday; depart after lunch on Friday. This course is for all levels of ability and beginners are very welcome. As well as the violin family, support can also be given for making a rebec (an ancient ancestor of the violin). The class size is limited so that participants have plenty of support from the two tutors. Before enrolling please contact Neville Gardner Neville@njgardner.demon.co.uk to discuss the suitability of the course for your needs. Neville Gardner is a former University Lecturer and has been teaching violin making for twenty years. Corrie Schrijver graduated from the Welsh School of Violin Making, with Merit in 1980. Since then she has worked at various workshops, making and restoring for professional players.